Place and Liveability- Which Street is More Liveable? The Place & Liveability Booklet is a word document ready for students to print and fill out. 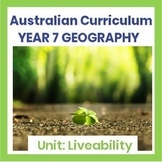 Inquiry Task description: How liveable is Australia? You will be exploring factors that influence where and how people live. 1. You must choose a country within Europe, North America, Asia or Europe. Have students move around the room learning different things about the liveability in Coober Pedy. Activities are a mixture of skills, comprehension and critical thinking. Supporting documents also included. 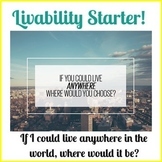 Livability Unit: If you could live anywhere in the world, where would it be? Year 7 Geography "Homework Ten"
A list of homework activities for Year 7 students. Most tasks are related to the Place and Liveability topic! A set of cards to be printed and laminated for students to discuss. Students can be given one card to research liveability in that place. 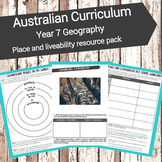 Alternatively, students can work in groups to compare a variety of places. 30 different locations included.